Right now, if you buy any Roland interface, controller keyboard or synth from any authorised UK dealer, you can also pick up Cakewalk Sonar X2 studio for just £59. SONAR X2 Studio is a fully-featured DAW that includes all the tools, instruments and FX needed to create professional-sounding music. SONAR X2 Studio contains 50 FX Chains, which you can think of as your "on call" engineer. These will ensure you achieve a polished, professional sound whether you're working with drums, bass, guitar or vocals. The FX Chains are also a great way to improve your own mixes as you can deconstruct what a pro-engineer has already laid out rather than start from scratch. Once you master FX Chains, you can create your own collection for instant recall in future sessions. Many Windows-based DAWs use a single-window design which can be cluttered, especially when you have many windows open. SONAR's Skylight interface avoids this 'window within a window' approach in favour of a modular approach, where different views can be docked and organised together within a single window. Skylight speeds up your workflow and provides a clean, simple and modern creative environment. SONAR X2 is by far the best DAW for Windows-based musicians. Cakewalk works closely with Microsoft and Intel® to integrate the latest technologies such as the 64-bit Double Precision Audio Engine. Put simply, this provides greater resolution resulting in more accurate audio reproduction and more headroom to reduce digital clipping. You'll really appreciate this when working with large projects containing many audio tracks and plugs-ins. Windows 8 multi-touch support enables 'swipe' and 'pinch to zoom' functionality, which transforms any touch screen into a virtual pad controller to trigger loops and one-shot samples. Along with the traditional track view found in most DAWs, SONAR X2 Studio also offers the Matrix View, a popular non-linear approach to creating music. You can populate the Matrix View with any combination of loops, phrases and one-shot samples, and then perform these parts in realtime with flexible live-triggering modes. Experiment with endless combinations and possibilities - and capture the results directly back into the Track View. SONAR X2 Studio doesn't force you to choose between linear and non-linear music creation - and that's how it should be. What support would I get if I get stuck? And with your new Roland hardware and SONAR X2 Studio, you'll only have to contact one company if you have any questions. If you're still unsure, you can try Sonar X2 for free with our fully-functional 30 day trial. 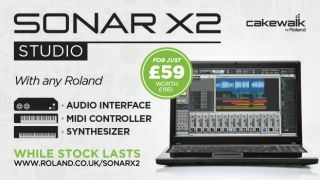 Once you're into the X2 workflow, just buy any Roland audio interface, controller keyboard or synth and when you register your new product, we'll send you the download code for the full version of SONAR X2 Studio for just £59. For full terms and conditions, and more information visit the Roland UK blog.